The Bay Hotel Motel is located near the shores of Lake Macquarie, gateway to the famous Hunter Valley Wine Country. We offer first class facilities and services: a modern 3.5 star motel, a pub full of amazing sporting memorabilia and a bottle shop with our exclusive Red Room. Become a member in a Social Club - Fishing, Golf & Darts. The hospitality and friendliness of the staff at the Hotel is second to none. You'll experience a real 'country' atmosphere amongst the people who work here. The staff and management at the Bay Hotel Motel regard quality customer service as their highest priority, endeavouring to meet and exceed customer expectations. We are 100% committed to ensuring you have a pleasant and comfortable stay. 1999 AHA Awards for Excellence - Best Bottleshop (Country) 2000 AHA Awards for Excellence - Best Sporting Venue (Country) 2001 AHA Awards for Excellence - Finalist - Outstanding Community Service We made the finals in the AHA Awards for Excellence 2001 in five categories: Best Sporting Entertainment Venue, Best Retail Bottle shop Country, Best Pubstyle Accommodation, Best Gaming Venue - Country, Outstanding Community Service. Deluxe Room - 1 Queen Size Bed & 1 Double Sofa Bed. Continental Breakfast available for $10.00 per person upon filling out a Breakfast Menu. Executive Room - 1 Queen Size Bed, 1 Double Sofa Bed & Spa Bath. 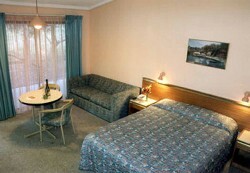 Family Room - 1 Queen Size Bed, 1 Double Sofa Bed, Set of Bunk Beds (suitable for small children), Microwave & Spa Bath. Continental Breakfast available for $10.00 per person upon filling out a Breakfast Menu. Triple Room - 1 Queen Size Bed & 1 Single Beds. This two bedroom unit is fully self contained with a kitchen and lounge area. Bedroom one has two king single beds. Bedroom two has three single beds. They share an ensuite bathroom with shower & bath. Relax in your own courtyard where smoking is permitted. Rate is for up to 5 people. 6.We are located on the right side of the road, about 1 kilometre after the School. 7.Turn right into the Bay Shopping Centre at the first roundabout or turn right at the second roundabout for the Motel Reception Carpark. Cancellation up to 24hrs prior to arrival with no charge. All requests will be considered on a same day availability basis.